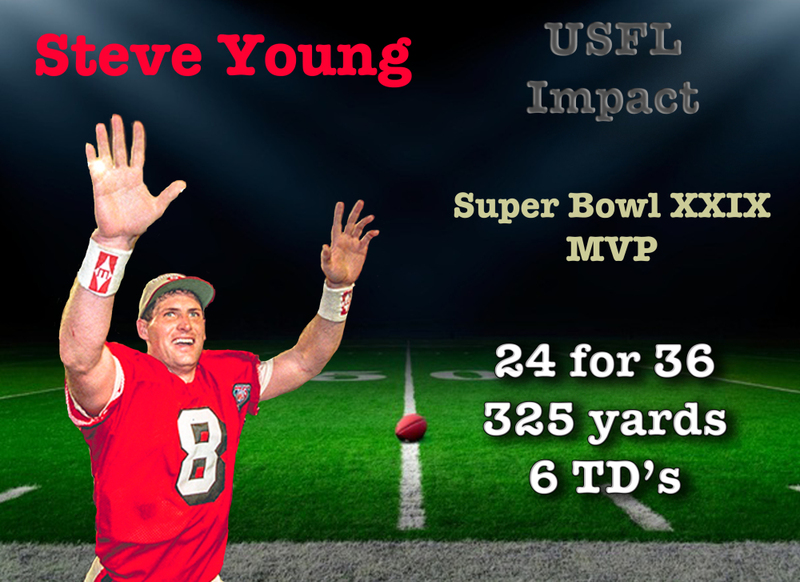 Steve Young was the second former USFL quarterback to make the Pro Football Hall of Fame (Jim Kelly was the first). Young was inducted into Canton in 2005 after a stellar professional football career with the Tamp Bay Buccaneers and the San Francisco 49ers, but it all started with a $ 40 million contract with the Los Angeles Express. The city of Los Angeles never embraced the Express like the cities of Detroit, Tampa Bay, Birmingham and Denver. The Colesium seats more than 90,000 fans, but the Express averaged under 20,000 its first two seasons (’83 and ’84), and less than 9,000 fans in the league’s final year of 1985. 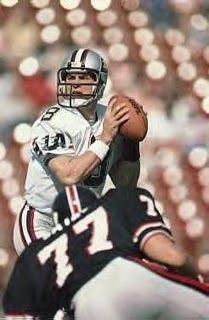 Young threw only 16 Touchdown passes and threw 22 interceptions in his two seasons with the Express. The Express won 10 games in ’84 under Young, making the playoffs and winning a triple-overtime game against the Michigan Panthers. The USFL proclaimed it the "greatest game" just because it took so long to come up with a winner. Ninety-three minutes and 33 seconds of play had ticked away before Mel Gray of Express ran for 24 yard touchdown to give Los Angeles a 27-21 win. “Michigan was ahead 21-13 with 8:57 remaining in regulation. On LA's final drive, the Express faced two fourth down attempts. They made them both. The second was fourth and goal at the one yard line. Kevin Nelson busted through for the touchdown, his second of the day, capping the 14-play, 80 yard drive that took 8:05 off the game clock. The Express trailed by two points. 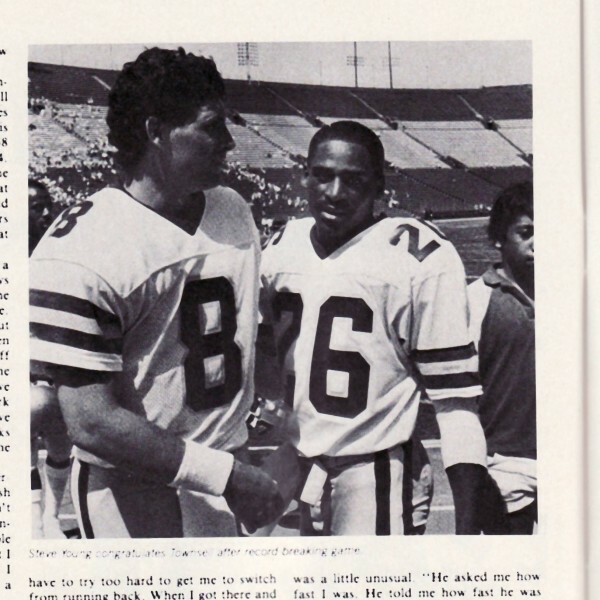 “Steve Young making his thirteenth pro start, took over the hero's role from Nelson. He rolled around left end and scampered in for the two-point conversion, tying up the game 21-21 with 52 seconds remaining in regulation” (remembertheusfl.com). Young bought out his USFL contract from the financially-stricken Express and headed to the NFL -- unfortunately he landed in Tampa Bay.